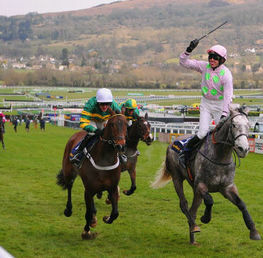 Another fabulous Cheltenham Festival comes to an end with the final showpiece event, the Gold Cup. 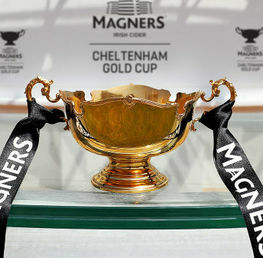 We overview our recommended tips and betting offers you should take advantage on Gold Cup day. The Cheltenham Festival is the time of year to switch or add another bookie to your collection. 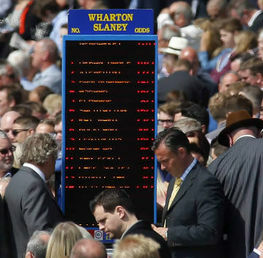 Bet365 have the biggest new customer deposit bonus available for Gold Cup day. As a new customer you claim up to a £200 deposit bonus when you sign up as a new depositing customer with bet365. You can of course claim a lower amount if you prefer, making this perfect for Gold Cup day! Bet and claim up to a £200 deposit bonus with bet365 - Bet Here! 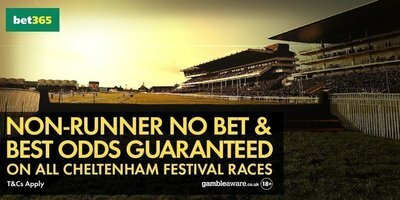 Bet365 were one of the first bookmaker’s to announce they will be Non-Runner No Bet (NRNB) and Best Odds Guaranteed for all 7 races on Gold Cup day at the 2017 Cheltenham Festival. Existing customers can also benefit from the bet365 Price Promise and ITV Racing 4/1 Offer on Gold Cup day. Four fantastic reason’s to bet with bet365 on Gold Cup day. Price boosts on Gold Cup day at Cheltenham Festival from 8:30am! 20/1 on Cue Card, Native River, Djakadam or Sizzing John to win the Gold Cup at the Cheltenham Festival 2017. 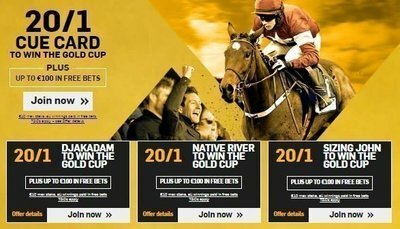 Bet and claim this 20/1 on Cue Card, Native River, Djakadam or Sizzing John to win the Gold Cup Cheltenham Betfair Sportsbook offer - Bet Here! Note this offer ends at 3:30pm on Friday 17th March. 20/1 Cue Card to win the Gold Cup at Cheltenham Festival 2017. 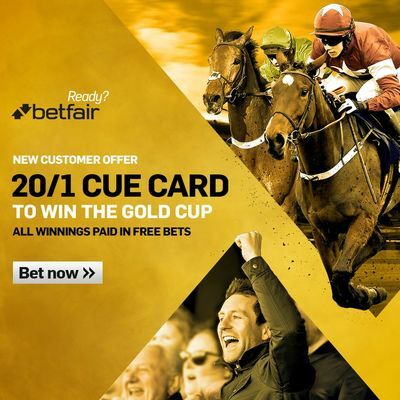 Bet and claim this 20/1 Cue Card (to win the Gold Cup) Cheltenham Betfair Sportsbook offer - Bet Here! 10/1 Djakadam to win the Gold Cup at Cheltenham Festival 2017 (Max £25 stake). 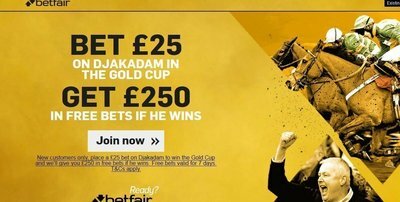 Bet and claim this 10/1 Djakadam (to win the Gold Cup) Cheltenham Betfair Sportsbook offer - Bet Here! 18/1 Death Duty to win the Albert Bartlett at Cheltenham Festival 2017. 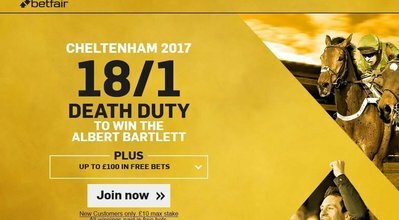 Bet and claim this 18/1 Death Duty (to win the Albert Bartlett) Cheltenham Betfair Sportsbook offer - Bet Here! Note this offer ends at 2:50pm on Friday 17th March. 12/1 On The Fringe to win the Foxhunters Chase at Cheltenham Festival 2017. 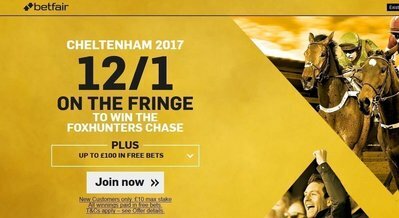 Bet and claim this 12/1 On The Fringe (to win the Fochunters Chase) Cheltenham Betfair Sportsbook offer - Bet Here! Daily price boosts each day of the Cheltenham Festival from 8:30am. Bet and claim your Betfair Sportsbook £30 free bet offer - Bet Here! 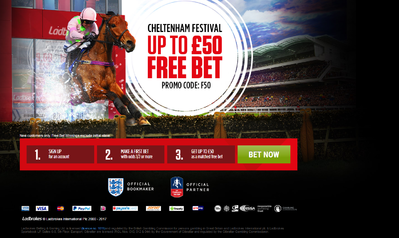 Ladbrokes are offering a £50 free bet for new customers on Gold Cup day at Cheltenham. Sign up with the promo code F50 and place a first bet at odds of 1/2 (or more) and you will qualify for a free bet up to £50. Bet and claim your Ladbrokes £50 free bet offer - Bet Here! 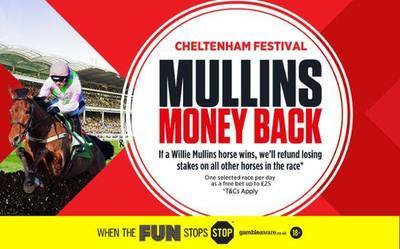 In one selected race on Gold Cup day at the Cheltenham Festival 2017, Ladbrokes will be offering a free bet refund (up to a maximum free bet of £25) on all losing bets if a Willie Mullins trained horse wins the race. Best Odds Guaranteed Plus is a great bonus for existing customers. If your horse starts a higher price, Ladbrokes will not just match that price, they’ll boost it! Say you bet at 3/1, that wins off an starting price (SP) at 4/1, Ladbrokes will pay out at 9/2. Ladbrokes have announced they are Non-Runner No Bet on all 7 races on Gold Cup day at Cheltenham Festival 2017. This means, if you place a bet from now until the race starts, your stake will protected, if your selection doesn’t run. Daily price boosts each day of the Cheltenham Festival from 8:30am. Ladbrokes are promising to offer 10 price boosts per day. 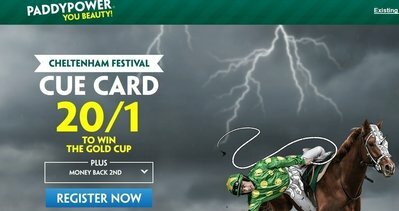 Paddy Power are offering a selection of Enhanced Betting Offers on the Gold Cup. 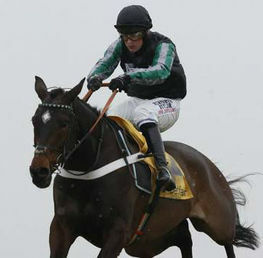 Bet and claim this 20/1 Cue Card (to win the Gold Cup) Cheltenham Paddy Power offer - Bet Here! 20/1 Djakadam to win the Gold Cup at Cheltenham Festival 2017. 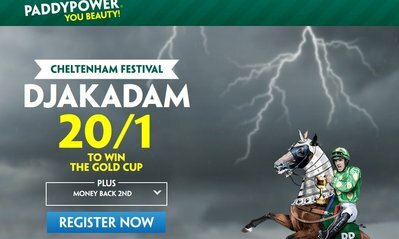 Bet and claim this 20/1 Djakadam (to win the Gold Cup) Cheltenham Paddy Power offer - Bet Here! 12/1 Defi Du Seuil to win the Triumph Hurdle at Cheltenham Festival 2017. 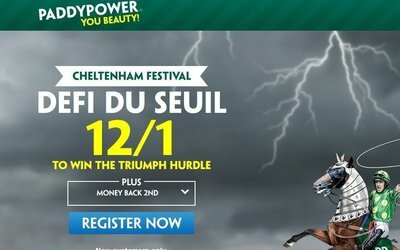 Bet and claim this 12/1 Defi Du Seuil (to win the Triumph Hurdle) Cheltenham Paddy Power offer - Bet Here! 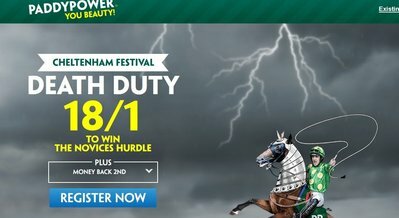 Bet and claim this 18/1 on Death Duty (to win the Albert Bartlett) Cheltenham Paddy Power offer - Bet Here! Paddy Power are offering moneyback (max £20 free bet) if your horse finishes 2nd in any of the first five races, every day at the 2017 Cheltenham Festival. Paddy Power are Non-Runner No Bet on every single race at Cheltenham Festival 2017. Bet and claim your Paddy Power £30 free bet offer - Bet Here! 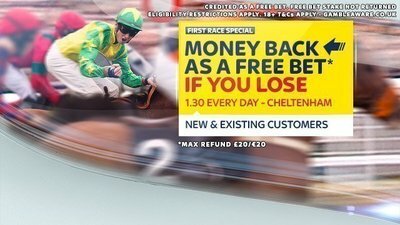 Great offer for all customers at Sky Bet; if you lose on the Triumph Hurdle at Cheltenham Festival 2017, Sky Bet will refund your stake as a free bet up to £20! Bet and claim your Sky Bet offer - Bet Here! 1530 Cheltenham: Timico Cheltenham Gold Cup Chase: We’re firmly behind Native River to land a first success for the Colin Tizzard team. Although we are suggesting some pennies (or pounds!) on Paul Nicholls’ underachieving Saphir Du Rheu to emulate the 1990 Gold Cup hero long shot Norton’s Coin! Stranger things have happened! Native River is now generally a 9/2 (with Betfred) chance whilst Saphir can be pounced at for a whopping 66/1 with Betfair Sportsbook. Really competitive. If your week is going well and fancy a fun flutter, I would suggest throwing a couple of quid each way at Protek Des Flok who has decent form. 33/1 best with bet365 and BetVictor. The final race can be an enjoyable fun flutter or one last dance if the rest of the week has been a shocker! If you think you might be in the latter category you wouldn’t go too wrong with the Colin Tizzard trained Quite By Chance who has had some spelndid form this season including a fabulous run behind former Champion Chaser Sire De Grugy at a valuable handicap at Ascot last November. 33/1 best with BetVictor and Coral. Good luck on Gold Cup day!